Pol Bury Kinetic Mirror Ball Sculptural Fountain at the Palais Royal in Paris France. This kinetic sculpture was created by Belgian artist Pol Bury. 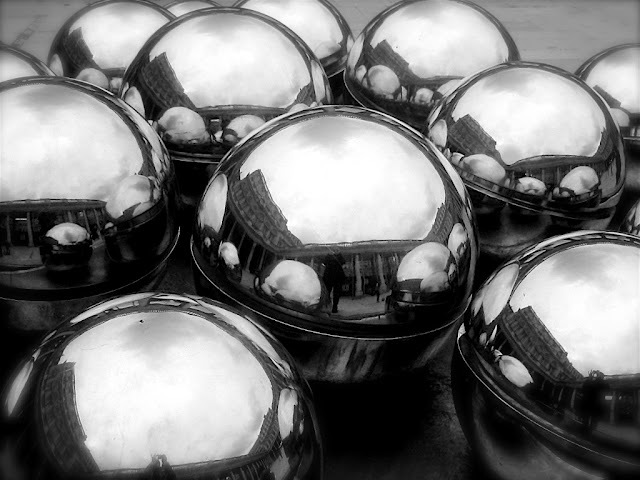 These chrome balls gently move up and down with the rhythm of the water while reflecting the passersby. Pol Bury began his artistic career as a painter, working in the Jeune Peintre Belge group and the Cobra group. In 1953, he took up sculpture and was one of the leading artists of the Kinetic sculpture movement. Four years later, Bury was incorporating electric motors into his sculptures. Later, he worked as a filmmaker and stage designer. Stare long enough at one of Pol Bury's unsettling kinetic sculptures, and you may start to feel like those scientists in The Andromeda Strain searching for signs of microscopic alien life. Suddenly, you're startled by tiny, possibly imagined, movement. In this small exhibit of the artist's rarely seen devices, something a little eerie is happening. Pol Bury, the Belgium-born Parisian who died in 2005, started out in the late 1940s as a painter of Magritte-like surrealism. But after encountering Alexander Calder and the sculptor's mobiles in 1952, Pol Bury ditched the brush for the electric motor and devoted himself to the art of motion. Apart from a few examples of cinetasions (photographs he altered to suggest the shifting of space), all the work here gives nascent life to small populations of objects. In a piece from 1962, 16 Parallelepipeds, small rough squares of copper struggle to turn and touch each other. In others, spheres shift and shake, filaments slowly wave, and wooden blocks try to communicate something. Occasionally, you can hear the faintest of sounds. Pol Bury achieved such effects with clever mechanisms of motors, magnets, strings, and springs, but by keeping it all hidden, he created a sense of basic Nature: the will to exist. Rewarding patience, Pol Bury's marvelous living works, are ultimately endearing. As a young artist, born in Belgium and educated in France, Pol Bury met and was influenced by the Surrealist René Magritte. Bury was working as a painter at the time and began to participate in Surrealist group exhibitions. He abandoned painting in 1952, however, after encountering the work of sculptor Alexander Calder. Calder's mobiles, in particular, made a strong impression on Bury, who would go on to become one of the first practitioners of "kinetic" art in the 1960s. Bury emphasizes movement as an essential element of sculpture, stressing that his works are not complete until they are set into motion. His first kinetic pieces, from the 1950s, were weathervane-like sculptures that were activated by the viewer. 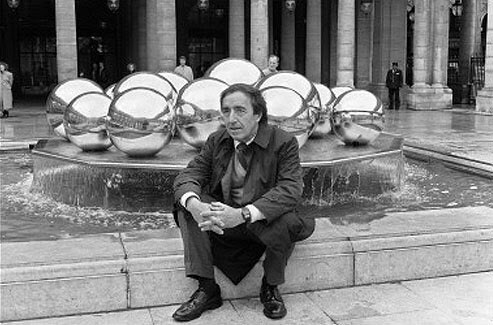 In the later '60s, he began working in stainless and Cor-Ten steel, producing monumental balls that spun or rolled, columns that rotated, and planes that tilted, all operated by concealed electrical mechanisms. The movement that he assigned to these sculptures was often a slow, often imperceptible action that did not immediately register in the viewer's eye. Pol Bury's sculptures with their unexpected and irregular motion can have an unsettling effect on the beholder. This element of surprise and chance is a legacy of the Surrealist movement, which has never fully ceased to inform the artist's work. Bury has lived and worked in France and the United States and has received a number of large-scale public commissions for locations throughout the world, including projects for the Palais Royal in Paris and the 1988 Olympic Games in Seoul. He has also created a number of fountains that incorporate water as an additional ingredient of movement in his sculpture.